← Fixed Verb Patterns: Gerund, Infinitive or Both? So, which practical steps can you take to stop these nerves from compromising your start and damaging your overall effectiveness and impact as a speaker? Having a clear idea of your audience’s levels of subject knowledge, relative opinions and interests is central to giving an effective presentation. >> Invest some time to fully consider your audience, it’s discrete sub-groups, which of them are your proirities and how you can best tailor your intended key messages and supporting detail to them. A conscious awareness of who they are and how best to reach them before you formulate your content and decide how best to deliver it will make you more sure of yourself…and so more confident! You know what you want to say – but have you structured your slides/information with a focus on ‘them’ and not ‘you’ – i.e. making sure your main messages are clearly organised, crystal clear and properly contextualised, supported and reiterated for your intended audience? >> Ensure your key messages and supporting information are clearly and logically organised. This way, they are easier for you to deliver confidently. In parallel, your audience will find them easier to follow and more engaging – meaning you will keep their attention better. You’re actually going to deliver your material/PowerPoint, so trying to prepare yourself by simply reading it through numerous times is never effective. >> Rehearse your material by actually delivering it. This will help you identify any ‘sticking points’ so you can refine them as well as ensuring you’re within your allotted time budget. Equally, it allows you to work out and practice key value-added elements such as body language, pausing and emphasis as well as transitions between slides if you’re using PowerPoint. Remember: don’t be fooled by the urban myth that some people are just born ‘naturally good’ presenters and public speakers. Yes, some people are more suited to it by character. For this to be relevant to an excellent performance, they will also most likely be very experienced. Above all, however, they are simply very well rehearsed. Case Study: for a key presentation at an annual sales conference, the European Director of a major international company – already widely recognised as an outstanding public speaker – rehearsed the full version his 45-minute presentation with my real-time coaching four times in two days. In between each ‘full rehearsal’ on stage, he spent numerous hours refining and amending his key messages and content. A natural? Maybe. Well-rehearsed? Definitely. 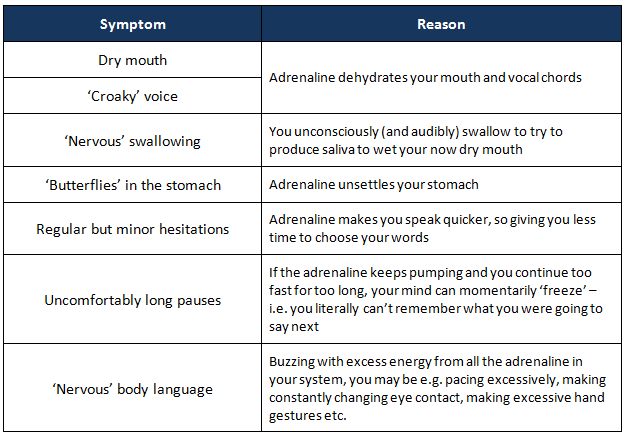 Hydrate not dehydrate – adrenalin can cause a dry mouth, which in turn leads to having to swallow repeatedly as your mouth tries to produce saliva. Avoid coffee, energy drinks and alcohol for at least two hours before – they compound the problem. Ensure you drink a couple of glasses of water in the hour before your presentation. Have a glass of water with you when you present, taking sips occasionally to keep yourself hydrated. Use positive visualization techniques – imagine that you are delivering your presentation to an audience that is interested, enthused, smiling, and reacting positively. Cement this positive image in your mind and recall it right before you are ready to go on. Remember: your audience are there and ready to follow you if you give them reasons to do so. Practice deep breathing – adrenalin causes you to breathe shallowly. By breathing deeply just before you present, your brain will get the oxygen it needs and you will lower your pulse, calming you and helping provide the platform to show your audience a measured and confident start. Smile – this naturally relaxes you, sending ‘positive’ chemicals through your body and so counteracting your adrenaline. Equally, ‘smiling like you mean it’ also projects confidence to the audience. Engage your body language – don’t be static. Eye contact, measured hand gestures and planned movement – e.g. repositioning yourself to the other side of the screen during a transition between slides – helps you expend some of your nervous energy and projects confidence and control. Manage your speed through pausing – pausing regularly within and between messages helps you moderate your speed and manage your breathing. Remember, an ideal speed for public speaking is c.20% slower than you would normally speak in a conversation. This is doubly important at the start, as you want to catch and keep your audience’s attention, not lose it by nervously rushing through your opening material. The core of managing your nerves throughout your presentation/speech are the same as those most important at the start: i.e. using your body language to your advantage and managing your speed through regular pausing and breathing. Coping with ‘slip ups’ – we’re all human. Consequently, we will inevitably have a few moments during our presentation when we ‘slip up’ – i.e. become tongue-tied, forget what we want to say next or explain something in an ‘unnecessarily overcomplicated’ way. When you realise you’re slipping up, you get a sudden burst of adrenaline, ironically making you more likely to follow your ‘slip’ with another one! What defines you is not if you slip up, but how quickly and smoothly you recover from it. Step 1: Be psychologically prepared for this happening a few times. Bear in mind your audience will quickly forget it if you recover quickly and confidently. Step 2: Be prepared. 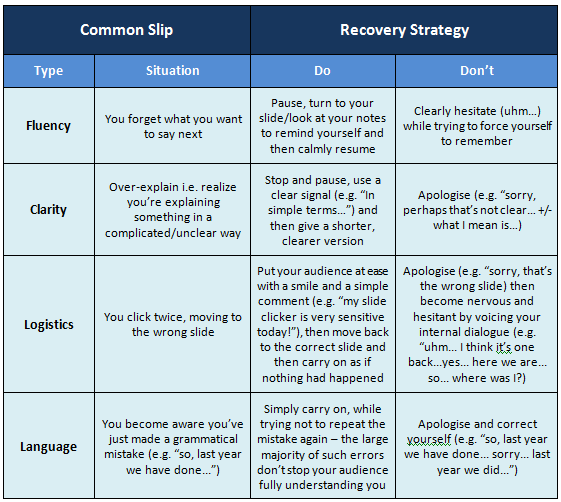 Since experiencing a few of the typically observed slip ups is predictable, you can prepare your ‘recovery’ in advance. So, what are these ‘typical’ slip ups and what’s the best way to deal with them? When it comes to presenting, nerves are inevitable… but letting them ‘defeat’ you is not. What separates highly effective presenters from the rest is not if they have nerves, but how they manage and channel them towards their goal: an effective communication. …and good luck with your next presentation or piece of public speaking! Visit http://www.lacstraining.com to download a full catalogue of our training offer. Thank you for your positive comments – I’m pleased you found the post helpful!